One of the big stressors of moving is making sure you are keeping all your stuff safe and secure. Most of the time when we think about the things we want to keep safe, we’re talking about breakable items or electronics. People who pay attention only to those things and ignore softer but still delicate items such as a couch or mattress are going to regret they didn’t put more attention on those items. When you really stop and think about your mattress, you will realize you are trying to keep something safe that you spend a good deal of your life on. The mattress might not break in transit, but it can rip, tear or pick up stains and dirt you wouldn’t want on there on the best days. 1. 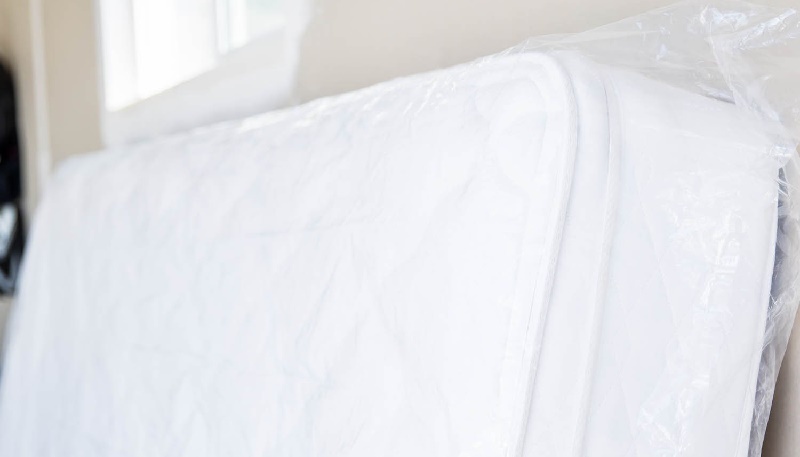 Use Plastic Liberally: In order to keep dust and bugs and anything else that could be picked up during the move away from your mattress you are going to want to wrap it in plastic. The same kind of plastic people put on their couches or chairs in order to keep dust and stains off either when you are loading up the moving truck or taking it off. This kind of plastic does more than just keep mattresses from getting dirty. The plastic wrap also makes sure that the mattress isn’t going to rip or get a gash in it. When talking about moving, there is liable to be a few sharp objects around. This plastic acts as a kind of guard against those sharp objects causing some serious damage. The last thin you want to do is get to your new place and find out you have to have to get yourself a brand new mattress. 2. Pillows Under The Mattress: If you place a couple of pillows or cushions under your mattress, you will find peace of mind when it comes to your travels. These cushions will act as a buffer when you are moving and keep the mattresses from getting bounced around as much. These will also help when you are putting the mattresses on or taking them off the moving truck. You should use old or used up cushions or quilts that you don’t want to keep around any longer. They will allow you to slide the mattresses off the truck, without the fabric of the mattress getting snagged or dirty. 3. Put Them Inside a Truck Or Other Vehicle: In your travels, you might have seen someone tooling down the highway with a mattress or two tied to the top of their car. This is done because people think they can’t break and therefore are quite durable. While this is technically true, if you want to protect your mattress, you should make sure they are in, out of the elements. Depending on where you are traveling to, you might want these inside because it’s going to be a long drive. Maybe you just want to make sure you don’t look like a fool tooling down the highway. Either way, making sure the mattress you are hauling is in a covered truck or car is going to make sure you have actually protected your wonderful mattress. You’ll be happier and healthier if you make sure the mattress is kept clean and safe.